The stores have begun the Christmas shopping season already which means that they are tempting you to rush towards Christmas day and completely miss the liturgical season of Advent. Stop their madness. Slow down. Breathe. In doing so, you will fill yourself with wide eyed anticipation for the real reason of the season; the coming of the savior. Did you know that Advent marks the beginning of another liturgical year? (Pay attention. The hymnals in your church will change with the beginning of Advent; another clue that we are moving into the next year in our church history.) Advent comprises the first four weeks of the new liturgical year. It is the time when we prepare our hearts and homes to receive our Savior. 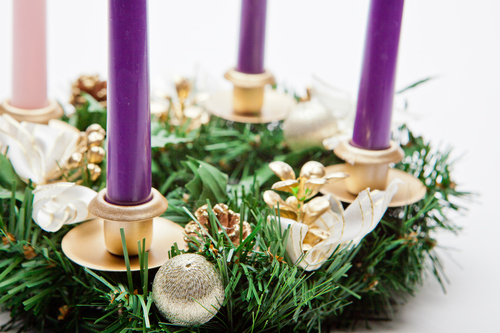 There are many wonderful ways for families to celebrate Advent within their home. There are countdown calendars, advent wreaths, prayers and songs that get us ready to welcome the baby Jesus into our life. Each of these activities teaches the value of patience and helps build our anticipation for Christmas Eve and the Christmas season. The Bishops of the United States have a wonderful resource page for you to visit that provides you with great ideas on how to enter fully into the season of Advent. You can find everything at: http://www.usccb.org/prayer-and-worship/liturgical-year/advent/ . Alice Heinzen is the director of the Office for Marriage and Family Life. You can reach Alice at aheinzen@diolc.org.